Well, obviously, her brother Shane's restaurant Pastiche on Elm Street is one of her happy places, as is just about any restaurant with good food (and screw the boring vegan places, or the uptight fine dining establishments with snooty waitrons). 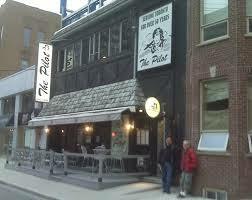 Any bar with good live music is a fave, as is any decent patio not facing a noisy, dirty street. 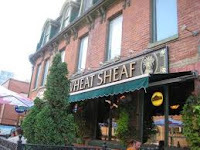 The Wheat Sheaf (King West), and The Horseshoe (Queen West), as well as any authentic dim sum, Indian or Thai restaurant. Sasha lives in Riverdale, on Carlaw, between Danforth and Gerrard. The renovated red brick detached home she shares with dad Jack and brother Shane is the home she grew up in. Not surprisingly, Sasha loves The Danforth. Other favourite neighbourhoods include The Esplanade and St. Lawrence Market, Queen Street West, and Kensington Market. I think Sasha is holding out on us. I swear I saw her on Centre Island with a loud crowd of otherwise ordinary types. Hard to say for sure becuase it was pouring rain and the bunch of them were gathered around a large tree singing "Patricia the Stripper".